Monthly recap January '16 | Moving & Beauty and the beast. We also moved into our new place. We did the big move on Saturday January 2nd and things are coming together now. We had a lot of trouble with gass and electricity, but that worked out. We also had to fix a leaking pipe and we went through some internet drama, but we are together and it's starting to feel like home. Just a few boxes left. I will post some picture when it's all done! My shelves are entirely done and I can finally showcase my collection in the way they deserve it. I donated around 250 books (crazy, right?) and it was hard in the beginning, but I'm really happy I did it. More space for all the new books I got, hehe. There was a book club meeting and we had our Secret Santa exchange. Everyone was happy with their gifts, we had great food and a good service. We also had a second book club where we ate sushi, yum. We celebrated the 55 years of happy marriage from my grandmother and grandfather by going out for dinner. It was fun hanging out with the family and yummy food! It is adorable to see those two together, still in love. I'm going to cheat and use an older TTT that I forgot to share. Every year I try to read as many books as possible, but in the end you always find out there are still a billion other book waiting for you. I think 2015 has been the most spectacular year so far, with many publication that made me wish I had an endless amount of time (and money) Here are ten books published in 2015 that I was planning to read, but then didn't. Sabaa Tahir – An ember in the ashes. This book was really hyped up, but then the negative reviews started to pour in on my feed and I lost track of it. I might pick it up anyway, but it's not high on my priority list anymore. Marie Rutkoski – The winner's crime. I have no excuses for this one. I definitely need to get a copy and read it. Julie Kagawa – Iron warrior. I simply forgot this book was released this year. Definitely a book I want to read any time soon. Sort: Blackthorn & Grim #1. In exchange for help escaping her long and wrongful imprisonment, embittered magical healer Blackthorn has vowed to set aside her bid for vengeance against the man who destroyed all that she once held dear. Followed by a former prison mate, a silent hulk of a man named Grim, she travels north to Dalriada. There she'll live on the fringe of a mysterious forest, duty bound for seven years to assist anyone who asks for her help. Oran, crown prince of Dalriada, has waited anxiously for the arrival of his future bride, Lady Flidais. He knows her only from a portrait and sweetly poetic correspondence that have convinced him Flidais is his destined true love. But Oran discovers letters can lie. For although his intended exactly resembles her portrait, her brutality upon arrival proves she is nothing like the sensitive woman of the letters. With the strategic marriage imminent, Oran sees no way out of his dilemma. Word has spread that Blackthorn possesses a remarkable gift for solving knotty problems, so the prince asks her for help. To save Oran from his treacherous nuptials, Blackthorn and Grim will need all their resources: courage, ingenuity, leaps of deduction, and more than a little magic. People who follow me for a long time might get tired of this, but I’m going to repeat it again: I love Marillier and she’s one of my favorite authors. Her books always have something magical to me and while this first book didn’t live up to Daughter of the forest, I really enjoyed it and I’m impatiently waiting for the sequels. This book tells the story of three different point of views: Blackthorn, Grim and Oran. Their separate stories come together to craft an interesting plot that hold few surprising twists; but it managed to hook me to the story nevertheless. John Connolly – The book of lost things. The author made it really easy to connect with the young boy David, which is not an easy task. There was not a moment where I felt the voice was too young or too old; it was simply perfect. The subtle use of the fairytales and how they are not the perfect happily-ever-after characters, the emotions throughout the story, the character development; I loved it all. David misses his mother and he has a hard time accepting the fact that his father has a new woman in his life; and that he has a little brother. His behaviour felt realistic and I liked the aspect of his family and how he slowly starts to accept his new life. Gah, this is one of those books I want to reread very soon. Margaret Peterson Haddix – Just Ella. I started this book with high hopes, but it turned out to be a disappointment. The author managed to use a creative spin on the original tale, but that’s pretty much all I liked about it. The tale of Cinderella and the fairy godmother turned out to be a simple gossip; Ella’s real story is less magical. That was interesting – and also the way her happily-ever-after evolves was a nice addition. Ella was okay. I had a feeling I SHOULD have loved her, but in the end I didn’t. She stands up for herself, she manages to escape out of prison and in the end she realizes there is no such thing as love-at-first-sight, so she had all the right aspects to turn into a great heroin. She just felt too flat and I had no connection whatsoever. Brianna Shrum – Never Never. RATING: 3 out of 5. I received an eARC from the publisher on Netgalley. I’ve always had my doubts about Peter and a feeling there was more to Hook than the information we’ve been given. This is one of those books that made me feel sorry for Hook. James is an innocent boy who wants nothing more than growing up. One day he meets Peter and the boy promises him that he can take him to Neverland for a vacation. Instead, James is dumped there with no way to return to his old life. He turns bitter and starts to see Peter for the hateful, childish boy he is. We also see glimpses of Wendy and Tiger Lily. This book went on for too long; there are many repetition and it started to get boring, but the ending was worth it. Have you read any of these books? Interested in one of them? Published: September 29th 2015 by Henry Holt and Co. Sort: Part one of Six of crows. This book is set in the same world as the Grisha trilogy. This could have turned out as a lazy way to skip all the word-building, but Leigh brings amazing new details to her world and perfectioned it. This book actually makes me want to reread the Grisha trilogy again. I was a big fan of Shadow and Bone, loved Siege and Storm, but was disappointed by Ruin and Rising. She made me fall in love with her world all over again and it was great to find out that Six of Crows is set in The Netherlands! This is definitely my favorite work by Leigh so far, because it has everything I was looking for. This is one of those books that I will reread often. First off, if you haven't signed up for this challenge, you can until February 1st. Go to the introduction post with the master sign-up linky. Other technical details: don't forget to tweet and Instagram with the hash-tag #fairytaleRC. I am SO excited you guys! There was a moment where I wasn’t sure if I wanted to host the challenge again. It’s quite time consuming and I wasn’t sure if I had enough ideas, but then I had a moment of inspiration and I wrote down tons of ideas for the monthly posts. It’s a shame I didn’t receive many feedback on my November 2015 post, but I got a few new ideas from people and I will work with it. I thought this would be a good time to recap the Fairytale challenge from 2015 and to give you a little view of what you can expect from 2016. Sign-up post, where 142 participants joined. February | Quiz to find out your ending. March | Discussion: are fairytales over? May | My ideas for fairytale retellings. September | In defence of Disney princesses. One square is enough to qualify for the extra points in the giveaway! What can you expect from this challenge in 2016? I am planning to integrate Youtube and/or Instagram into the challenge. I have a puzzle, a new quiz, discussion posts, information and hopefully a few more challenges. 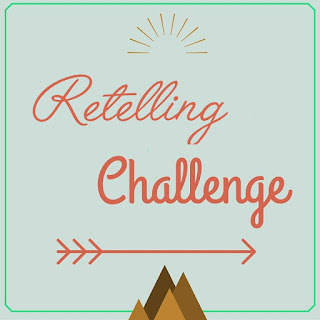 I'm also going to place a bigger focus on other retellings than fairytales, to make sure this challenge is suited for everyone! I'm also using at least one guest post, so I think we are up to some fun posts! If there is something you really want to see, let me know!